With Game 1 against Cliff Lee and the Texas Rangers tomorrow, the Giant's bandwagon is so full now, it's hard to find a seat. So why is ProfessorVC writing about the Giants? Do I need a reason? On paper, the 2010 Giants shouldn't have finished in the top half of the national league, let alone won the division and the pennant. With Timmy, the Beard, Smiles, Kung Fu Panda, Juan "a lot of happy" Uribe, they are just a fun team to root for. I had the opportunity to hang out with the left field bleacher crowd last Tuesday afternoon at Game 3 against the Phillies. Just one big party in Section 139 led by the guy in the picture above waving the giants flag and the guy in front of me leading the "What's the matter with Ibanez....He's a bum" chant. So back to the entrepreneurial discussion. A couple of things came to mind. The first is Ashkon Davran's cover of Journey's Don't Stop Believin' ,which has become the Giant's theme song during the postseason run. If you haven't seen it yet (and to date over one million folks have), it is worth the 3 minute stop before finishing this blog entry. Was that awesome or what? According to today's San Jose Mercury, Davaran has been trying to break into the music business for the past three years and after the release of this YouTube hit, has started getting calls about new projects. Entrepreneurial tip number 1: Follow your passion and you never know where it will lead. The search for a world series ticket brought up some more thoughts about entrepreneurial finance. Got me thinking again about how I passed on investing in StubHub. I've written about this before and I certainly wasn't the only one, but what a great business. There are currently 5,492 tickets listed on StubHub for Game 6. That is well over 10% of capacity and certainly answers the chicken and egg question founder Jeff Fluhr was asked many times in the early days. Not only are many season ticket holders and those lucky enough to have grabbed standing room only tickets in the online lottery, but ticket brokers (theoretically StubHub's competition) are very active sellers in the marketplace. Let's do some quick math. Out of those 5,492 tickets, let's assume 10% end up selling through StubHub at an average price of $800/ticket with combined buyer/seller fees of 25%. StubHub's take would be over $100K for one game! At a 90%+ margin with minimal risk. Now that's a money machine eBay acquired. So, I've never been a Journey fan. In fact, I was at the Rolling Stones concert at JFK Stadium in Philadelphia in 1981 when Journey got booed off the stage. Of course, booing is second nature for the denizens of Philly, infamous for having booed Santa Claus at an Eagle's game. Even so, I just switched my ringtone for the next couple of weeks to Don't Stop Believin...Go Giants!!! 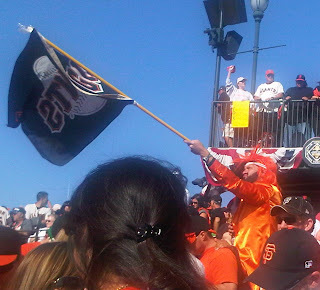 Good blog and of course Go Giants!!! Is There Any Truth in "The Social Network"?